Word to PDF Converter is a fast and easy windows utility to batch convert Microsoft Word documents into professional quality PDF documents. 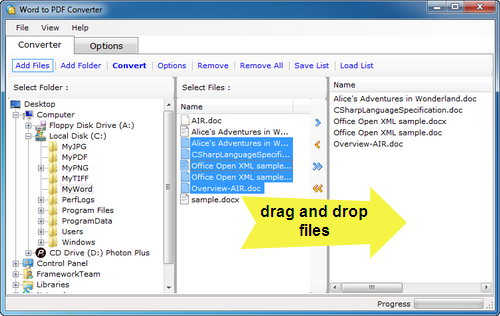 Simply drag the Word (.doc or .docx) files you want to convert to the file list and click the "Convert” button. Word to PDF Converter quickly re-creates your word files as fully formatted PDF files. Batch Convert Word(doc and docx) to PDF. More options to let you control the output file more accurately. Create PDF with high good quality. Automates the process of Word to PDF Conversion. Accurately retains the layout of the original document file. Save and load batch list.